-June, July and August 2009 2nd warmest for Northern Hemisphere and the Globe. Finally sun disk measurements return to a match with the global surface temperature trend. It took a while, but the lesson was learned, ENSO plays havoc with the surface temperature trend. But, does not change the overall global warming. The prediction below of spring summer El-Nino clouding over the Arctic and sparring a more massive melt just transpired, it was expected, clouds reflected enough direct sun radiation during the summer solstice to moderate a simili come back of Arctic sea ice. But a mild winter is in the cards, in some places a much warmer wetter winter. If El-Nino persists till the spring, and La-Nina follows, ships at the Pole will wander unobstructed in August 2010. Montreal's summer sun observations were more numerous in August, all indications of top tear sun disk expansions, with a tempered somewhat shrinking by June-July clouds, there was not one speck of green at sunsets barely less tardy than usual. Back in high Arctic, another matter, much warmer expanded sun disk expansions, with late September weather like late August. The warm winter is assured, aside from the usual unexpected cooling events (volcanoes), without a doubt, a warm fall will push into winter, clouds again playing a major role, along with warmer than usual weather and sea surface temperatures. All this open water reminds of 1998. August 2009 had the warmest seas ever measured worldwide, despite a weak to moderate El_Nino. The Global warming signal is here, clear and defined, 1997 having a much stronger El-Nino didn't bring up global temperatures as much, nearly by about half as much yet the summer El-Nino then was twice and a half as strong . There is an apparent lag in surface air heat transfer which will show as it did in 1998, when El-Nino Actually faded in the spring, a larger net temperature change will be felt this December January February, for the much warmer, and this will make 2010 the warmest year in history. Southern Europe and Northwest Africa baked and it was cloudy hence cooler East of the Rockies. Its quite fascinating to be making a correct projection. But the difference is thinner ice over much of North American Arctic, makes a repeat of the summer of 1997 not possible. Antarctica being warmer also fascinates, it should be very cloudy down there, as it should be, by extra cloud seeding caused by El-Nino, still not as strong as 1997, as then. Whatever cloud seeds are brought up from the deep tropical Ocean, or any ocean, affect clouds world wide. In this case El-Nino may be weak, but the upwelling rich in Condensation Cloud Nuclei. Montreal sun disk measurements were rare with the clouds giving this cold air anomaly. 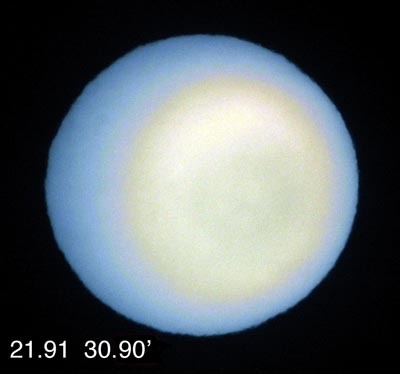 However Recent sun disks in clear air, are well expanded, making an average sun disk sizes for the summer 2009 must come with a caveat, that it missed the "cooler" air, which was due to clouds, and not a reflection of the natural balance found within a normal atmosphere, mixed with cloudy and sunny days more regularly. So the only analysis possible would be for August. Just heard from CNN very good meteorologist, Chad Myers, perhaps the best American met presenter on TV, explaining US extreme weather as caused by very unusually elongated jet stream as the culprit, that is correct. However the jet stream is not a random meandering snake like invisible pipe carrying a bunch of strong upper winds. It is located as it is, because there are more clouds East of the rockies (cooler wetter atmosphere), and less clouds West of the rockies (drier warmer atmosphere)... Its that simple. The cause of these clouds is explained below. .....Not exactly for Vancouver, but the West of the Rockies had less clouds, than to the East all the way to the West shores of Newfoundland. If you read below, I predicted very hot conditions for the Northern Hemisphere, along with cloudy conditions. The clouds cooled the summer for the East. Planetary waves and El-Nino took care of the West. Mean time in cooler Montreal, at +30 C today, despite extensive clouds, the cloudiest summer in every elders memory. Sun shots were expanded quite strongly the days before. Implying the presence of heat. The forecast was off by 4 C, not surprising given the propensity of clouds of late. Now for a brief period, a break in these clouds should be felt everywhere they left a mark, heat in itself causes deserts, RH lowers in high kinetic energy air, very hot conditions scatters clouds. But this will be brief. All current data will make this fall unusually warm, leaving no doubt, unless there is a dramatic event, 2010 the warmest year in history begetting, along with an even wider watery Arctic Ocean come September 2010, set to easily beat 2007. 2009 will come close to be warmest ever, if not be #1. as well. Cloud seeding theory makes the coming winter wet and warm for most North Americans, if La-Nina strikes come March 2010, Arctic Ocean ice will shrink incredibly. My basic understanding of weather has easily doubled over the last year. I've keenly observed the presence of much more Cirrus or even higher clouds , during this cloudy Montreal summer. Cloud seeding makes it so, Cirrus clouds being more numerous, essentially means that there are more nucleation seeds present. Another observation, just yesterday, Cirrus and Cumulus go hand in hand, stacked together, Cumulus eventually become Cumulonimbus, eventually creating Cirrus, seeds with Cirrus eventually will drop down, forming Cumulus and the cycle repeats itself. The Cirrus is lit at sunset on top of Cumulus clouds, above high Cirrus, Highly unusual clouds, I call them sunset clouds, visible during sunset, I don't think they are PSC's, but intermediates, hanging about the tropopause. Are these cloud seeds associated with El-Nino extra nucleation dumping? If so, fascinating, the very theory proposed mulled over, appeared in front of my eyes. La-Nina surfaces new cloud seeds, chemicals apt to rise from the deeper Ocean. El-Nino brings them up to the tropopause, they scatter with the high Upper winds. All is taken by the entire worldwide thundercloud network in a matter of weeks. This happens everywhere over the warmer oceans. El-Nino adds more seeds than usual, La-Nina makes less extra seeds than normal. Therefore last years deep blue. The spawn of anvil seeding theory, during a La-Nina episode. 2010 will make it a very successful theory, only if El-Nino breaks in March 2010. Otherwise will have to adjust this prediction. EL-Nino reappeared this summer although just starting, it has synergized with a world wide extra cloud coverage affecting both Poles. Here is how it works, or just about functions; there are more anvil nucleation seeds at or about the tropopause world wide, of which cloud seeding causes more clouds everywhere , irrespective of surface systems. Long range transport upper winds would make Antarctica surface weather warmer and cloudier in winter (it is warmer) and the Arctic cooler (it should be with current impressive cloud cover!). World wide temperatures were #2 in ranking, curiously not so for the Northern Hemisphere, great chunks of it were still cool under the continuous cloud shade. Antarctica, without ever knowing, should have been very cloudy this past June. Just like the Arctic (I know it was). I expected cooling in the Arctic during the large expanse of clouds almost continuously covering it since mid April. But I remembered the thin ice observations causing sunset shifts and expanded sun disks over last winter and spring in the Arctic. As during winter, the air right above the thinner ice is warmer. Ocean ice remarkable difference between 2008 and 2009 was not affected by clouds, very curiously, of which, absent from January to as late as end of May 2008, as to covering the whole Arctic since mid-April 2009 until present, yet ice surface extent is equal. So far , the most damage from the melt season was avoided by albedo, however present Arctic temperatures are remarkably warm, leading me to reconfirm again what was observed previously, the ice was thin, is thinner now, and is about to disintegrate over a wide area, possibly rivaling 2007. The heat wave expected over Europe materialized especially over Spain and western British isles. All in all, the exciting bit, is discovering the link between ENSO and anvil seeding, truly revolutionary simple concept which is predictable and repeatable. The bad part is the clouds dimming the lives of sun lovers. Now that its almost a certainty. El-Nino will affect weather world wide, of which using 1997-1998 as an example, world wide temperature averages will go up. This fits with my April projection by accident (no ENSO would have mean lesser clouds and a dead on projection), In North America, a summer El-Nino means a cooling, I am happy to explain this with the Anvil seeding theory. In spring 2009 Arctic, sun disk measurements were "hot" expanded, implying directly, thinner sea ice, but the over all atmosphere is not the same as surface temperatures. If clouds, as they are, reflect most of the sunlight back to space, the surface temperatures will be cooler, Montreal early June sun disk measurements, despite cooler cloudier surface weather, do not show signs of imminent cooling at all. The surface may be cooler, but overall temperature of the entire atmosphere is quite warm. However since most people live on the surface of the Earth, the clouds throughout Northern North America are so pervasive, as to literally cool the beginning of summer, for the surface dwellers, El-Nino increases over all clouds, whitin summer or winter, For North Americans it will be a variable summer, at times very hot, with cooler cloud driven periods in between, with obviously more rain. EL-Nino will warm things up , but in some parts of the world, you might think this is not so. Europe highly likely will bake, as with this August 1997 map when EL-Nino was in a hot state, most of North America was cooler, but Europe went into a hot spell. Cloud dynamics are such that nucleation seeds likely are useless over Northern Africa's Sahara, while South of America, the Mexican desert is so much smaller. The conclusions given resembles to my proposed Anvil seeding theory, the Stratosphere is largely very dry, it would take enormous amounts of moisture to make moisture give permanent clouds there. But Overshooting thunderclouds do leave cloud seeds, once cumulo nimbus anvils dissipate. There is another aspect, the stratosphere is largely getting cooler as global warming progresses. This is expected by models, but more heat from Cyclone thunderstorm overshooting may be created indirectly, by more clouds in the Arctic winter. I suggest a connection in thunderstorm stratospheric overshooting leaving an invisible trail of cloud seeding aerosols. The warming mechanism may be cloud seed redistribution particularly in the Arctic. ANVIL seeding in full bloom in the Arctic? As you read further below, and especially with 2008 news, Refraction temperature projections hit a snag in 2008. Whereas I was able to predict world temperature trends easily for years, since 2003, until about beginning of 2008. Then there was a major cloud free event, which caused a return to a cold winter. As the clouds were scarce, March ,April and May 2008 surface temperatures shot upwards significantly during spring. I observed a great number of sun disk observations, then, end of May onwards the Arctic clouded over, preventing a major Arctic Ocean melt similar to 2007. As it turns out, 2007 had a mild end of winter, tempered by EL-Nino, which infers a cloudy winter over the Arctic, however, there was a great melt, which occurred during summer of 2007 coinciding with an abrupt La-Nina starting in March 07. It was a perfect melt scenario, warm winter, cloud free summer, equated a great melt of Ocean ice in the Arctic. The refraction observation season was quite good for sunsets in the High Arctic 09, there were few clouds, from February till March, with gradual increasing cloudiness afterwards, again looking at the linked ENSO chart, the link is clear, La-Nina means a less cloudy Arctic, favorable for colder weather during winter.. This NOAA link attributes the common observations during ENSO periods. Essentially it proposes planetary waves as the immediate cause altering climate during EL-Nino events. However the jet stream position is not only affected by equatorial heat fluctuations. but by Arctic overall heat conditions the 2 conditions in tandem affect temperatures world wide. For instance the warm corridor, along the Can-Am rockies during winter as per link, is caused by the Arctic clouded over, Arctic in origin weather systems descending the corridor start at a warmer level. La Nina in winter reverses this scene, the cloud free Arctic is much colder during winter, the weather systems skimming down the East side of the rockies come from a much colder Arctic, this makes the East side of the rockies cold and dry. The stratospheric polar vortex plays an important role as well, if it rages strong it keeps clouds seeds in suspension until the vortex collapses. This vortex usually starts in November and ends in March, not always as such, but one must consider its influence seriously. Other ENSO events seem to confirm Arctic cloud extent fluctuations, as well as impacts over arctic ocean sea ice extent as well. As already showing in some parts of the world. Despite what the meteorologist says, skeptics about Anthropogenic Global Warming may be puzzled, a prolonged spotless sun must make proponents about Galactic Cosmic Rays baffled, after all should we be swamped with clouds? The high Arctic winter just past was mild, not so cloudy, not so devoid of clouds. Perhaps reflecting burgeoning ENSO neutral conditions. April 28 in Resolute marks the return of Snow buntings, incredible long distance little migrating birds, their arrival announce spring. A bit early if I am not mistaken. Sea ice is at all time thinness, signaling the disappearance of multi-year ice. It seems the Arctic is in a solid feedback warming spiral. No signs of change to that. Sun disk vertical diameters were already very expanded as reported below. Then, beginning of April struck "seasonal" lasting 3 weeks, before all time high temperatures ended the month. But all time high sun expansions never really relented, until mega boosts in size sprung at month end. The link appears to be with DWT's which maintained around 243-245 K range until end of month 250's which coincided with dramatic increases in expansion. There is no reason to believe a cold summer, despite no sun spots at all. An apparent contradiction if there was no supplementary man made greenhouse gases in the atmosphere. All time high temperatures everywhere in the Northern Hemisphere are foreseen,the only thing stopping a greater melt down of the arctic ocean ice, an encroaching El-Nino, fostering greater cloud coverage, as with the anvil seeding theory. I will delay somewhat my mid-April prognosis, the cold temperature North Pole was exactly about Resolute, this is not unusual, but it rapidly changed end of March trends, by a strong persistent bought of seasonal temperatures! Which requires more study. However, even in the middle of the cold temperature North Pole, sun disks went expansive, 2009 is #1 in vertical expansion for certain, which is to say, it may be a normal end of spring around Cornwallis Island, but it is not towards the West, over the northwest passage. Ice thickness is definitely key, and depends on several factors, salinity, sea and air temperatures, all of which affect each other, but the trump card is old ice, which melted a lot during the last few years. Old sea ice is remarkably salt free, so there was a great injection of fresh water over the sea surface from 2005-2007 especially, but now that most of the old ice is gone, summer melting of new ice in 2008 causes an injection of saltier water, which in effect does not freeze as readily. There is also the question of old ice, about its basic physical presence in great extents, affecting greater cooling/conduction of the surrounding newer ice. Vanishing old ice helps thinning the newer ice in its long night wake. This is seen, not only by measuring sea ice thickness, but by sun disk dimensions and sunset tardiness. 2001 was at the end of a prolonged La-Nina, which turns out to be the start of my extensive sunset observation research effort. In 2001 there was 7 sunsets lower than -2 degrees, well below the astronomical horizon. At the end of a La-Nina of 2008-09, there was no sunsets below - 2 degrees. A remarkable change.. Meaning; whatever ENSO gives, ENSO takes back, it is an overall temperature neutral event, but there was, since 2001 great changes in the Arctic, the Polar average temperature rose, along with thinner and the near disappearance of older ice. ENSO warms, then cools everything back, but overall its warmer. 1 K a year warming? So it seems, March is the turning point , when cold peeks, and warm moves in. Density Weighted temperatures seem to confirm it, where as EROAM is a temperature measurement of the entire atmosphere, calibrated to a standard March 238 Kelvin for the troposphere. 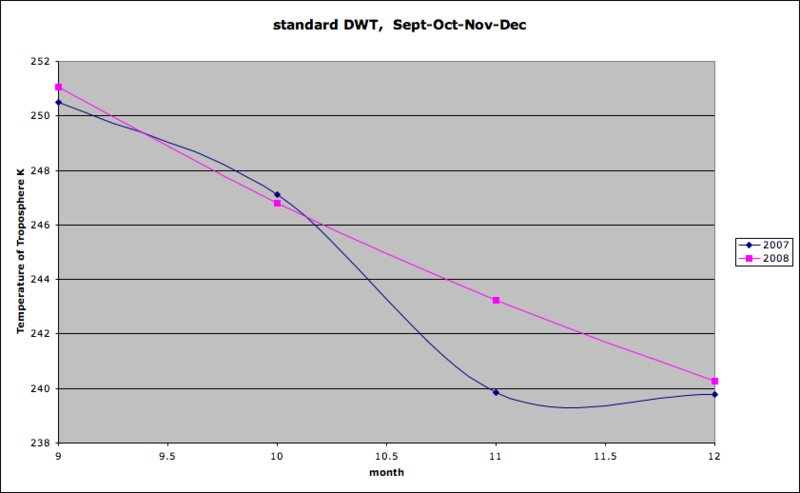 DWT, the standard method measure of upper air, also confirms it, even for 2009, since in 2009 there were only 18 days of inter-comparison for the graph. For the entire Month of March 2009, DWT was 239.8 K. March 2009 had a steady cooler period until the very end of the month, when much fewer comparisons were made. 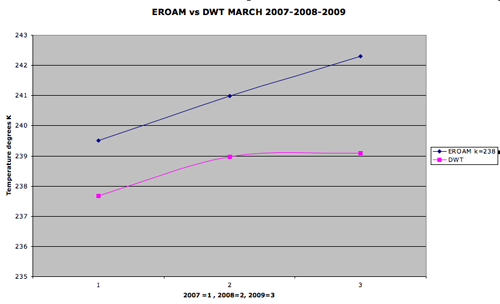 The difference in temperatures between DWT and EROAM is a matter of calibration, what matters is that EROAM kept on measuring warmer each year. 1 K a year seems like a big increase, but there is a need to continue and see if this trend continues, until next year. 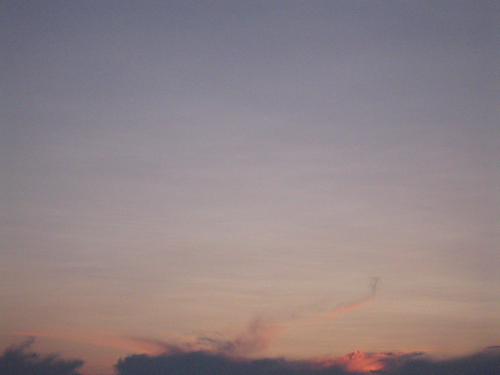 an equinox sunset , -2.60 degrees below the horizon during very warm 2005. To the right, a very similar sunset, a coincidental same day marvel, but it set much higher and much further towards the South. The difference between these two sunsets is not measured, since all the action is played over NW passage ice, and there are no stations there. The lower atmosphere in 2009 has to be warmer than in 2005. By deduction, Northwest passage ice in 2009 must be thinner than in 2005. It looks more and more like an extreme melting extent season is about to start. 2005 20%, 2006 16%, 2007 12%, 2008 13%, 2009 22%. 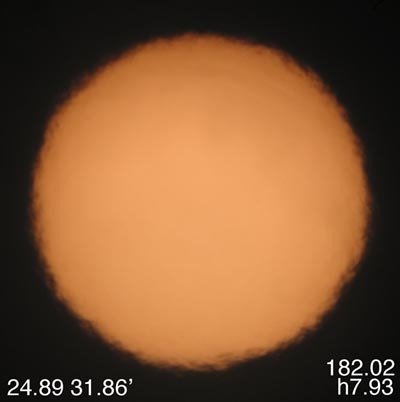 200 observations, average or single sun disk maxima comparisons between -1 and 10 degrees. This with mainly low sun observations at the coldest period possible, hence the low above horizon sun of winter end 2009 was more expanded vertically than with the sun disk averages of winter/springs in Resolute from the past 8 seasons. This means that it will be a warm spring, for the Arctic and likely more Southwards, ENSO is the trump card, changing prognostications for the wider Northern Hemisphere, however my latest projection for winter seems accurate for the Arctic, not the Northern Hemisphere. In the past, whatever the Arctic trend preceded the rest of the NH, it is not quite "back to normal" yet, but getting there, I must caution that confidence in in this projection is very high for the Arctic ( a near certainty), uncertain for the rest of the NH, until the mid April temperature projection. 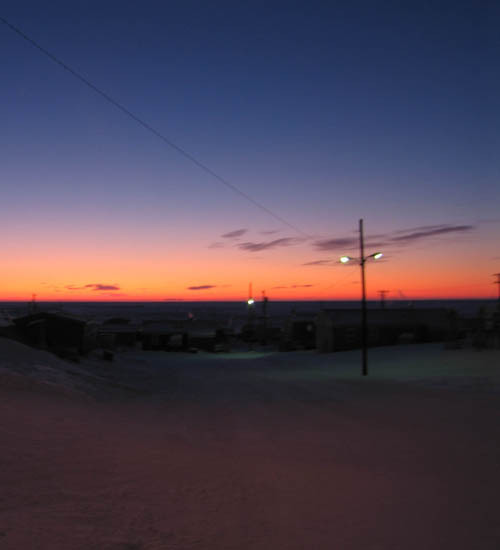 Equinox sunsets are known big events here in Resolute, clouds permitting. 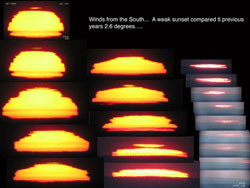 2001 and 2005 sunsets were as low as 2.7 degrees below the astronomical horizon. 2009 a paltry 1.86 degrees. Following a pattern more consistent than not of sunsets shifting Southwards, the last below -2 degree sunset was years ago. 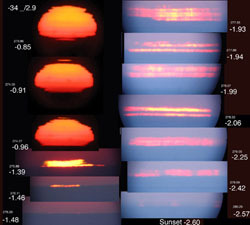 In this recent case, sunset sequence geometry between 09 and 05 were nearly identical, yet the boost upwards severely diminished. Suggesting thinner ice over the Western NW passage. Since the last LaNina there has been an apparent greater disparity between Arctic warmer surface air anomalies and Sub-Arctic. The Arctic virtually always leads the way in greater anomalies, since I do most of my refraction readings here, it is always easy to say the the rest of Northern Hemisphere will follow in warmer anomaly gains, but LaNina threw a monkey wrench into my Northern Hemisphere temperature projections. It seems that the last LaNina effects are fading, its cloudier than last year's big blue, I've noted several sunsets which appear to shift left, including much rounder in appearance. Standard DWT's have been remarkably warmer since September 08, on a streak of significant monthly warming compared to 2007 (except for October 2008). All this seems to confirm, the return of parity between Arctic and sub-Arctic anomalies making an Arctic Projection identical to the rest of the Northern Hemisphere. Anvil seeding theory seems potent and correct, there has been a greater Cyclonic presence North of Alaska, splitting the cold temperature North Pole in 2, assuring a milder winter scenario unfolding as expected. Would expect February 2009 data to show strong anomaly warming pretty much everywhere. Any light source, even artificially placed, on purpose for the same study, after a great well established analysis, can reveal winds not felt, neither measured, and this may increase wind shear knowledge and of course airport safety. Great Y-V Ulluq Q effect, following extensive week of deep cooling, warm air moved upwards , illuminating the twilight greatly. Look to the right of>>> and notice Somerset Island really raised above the ice horizon, mountains especially, as the horizon is raised, so is sunlight. The brightness is directly proportional to inversion lapse rates, which in this case, was off the charts, very strong. It is not technically a mirage, since more light is generated then otherwise would have been. Splitting of Stratospheric vortex, precursor to a cloudier warmer end of winter? If my Anvil seeding theory is correct, there will be no "big Blue" until the vortex reconsolidates, if it does that blue cold skies will return, if not there will be ample clouds everywhere, not just the Arctic, simply warming the Northern Hemisphere. -November 2008 very warm, Arctic Ocean ice freezing extent significantly slowed. Very warm troposphere mainly in November, caused by extensive cloudiness reflecting heat towards the surface, slowing the freeze up of the Arctic Ocean , with a lag, showing a virtual slow down in in December, causing a warming feedback. Remember 2007 was the warmest year in Northern Hemisphere history, end of 2008 center of the Canadian Archipelago is warmer than 2007. There are no signs of cooling just warming as expected... Stratosphere is cold but not as windy. Last year winds exceeded 200 knots. Vortex being not so intense means less mixing of particles.